Maruti India is one of the pioneers of the automobile revolution in India. This company was founded way back in year 1981 and since then has been tirelessly making wonderful cars for the masses. Their small car, Maruti 800 was their first car in the Indian market which broke the monopoly of the then popular Fiat and Ambassador cars. The stable of Maruti India is full of brilliant cars, which are fitted with fuel efficient engines and are affordable to one and all. Maruti cars are also renowned for being easy on the pocket in terms of repairs and regular servicing. One such magnificent hatchback from the fleet of the company is Maruti Swift, which is offered in both petrol and diesel versions. This hatchback was the top seller in the Indian car market in April this year and did close to 19,484 vehicles in a month. 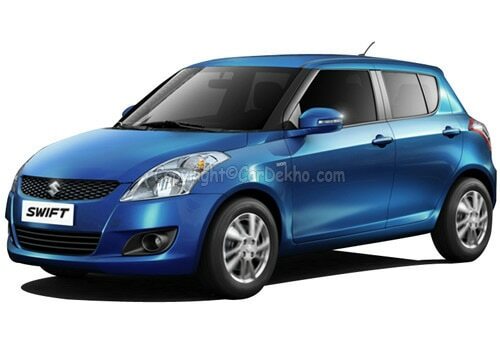 The Maruti Swift price for the entry level petrol variant is Rs. 4.44 lakh, while the diesel range starts at Rs. 5.53 lakh (both prices mentioned are ex-showroom New Delhi). Both the versions have 3 trims each for the buyers to choose from and are equipped with some impressive gadgets. The list of Maruti Swift features include roomy interiors with ample space and leg room, multi layered smart dashboard, a waterfall central console that has a multi-information LCD display system, a powerful music system with 6 speakers, multi functional 3-spoke leather wrapped steering wheel with mounted audio controls on it, keyless entry and many more such exciting features. The company has also bestowed this charming hatchback with several safety and protective features such as anti lock braking system with ventilated disc and drum brakes, a sturdy suspension for a smoother drive, dual front airbags, fog lamps for increased visibility, side impact beams and many more. The Maruti Swift pictures reveal a wonderfully designed body line of this hatchback with a sleek front grille and a broad head lamp cluster with a pair of fog lamps affixed in the front bumper. The sides have been blessed with a newly designed set of alloy wheels, while the wing mirrors have the side turn indicators integrated in them. The rear end has a big tail lamp cluster and also a high mounted stop lamp along with a rear wash and wipe with a defogger on the rear wind screen. Overall, this amazing hatchback is a complete package filled with all the features needed in a hatchback at an affordable price as well. Meanwhile, quite a few vehicles such as Tata Safari Storme, New Chevrolet Captiva, Renault Duster, BMW X1, Premier Rio Diesel, New Hyundai Elantra, BMW 3 Series and Volkswagen Jetta petrol are anticipated to be launched very soon. I shared that BMW 3-Series F30 Coming on 19th July.